UFC 223 has suffered another massive setback, as it’s being reported that Max Holloway’s been deemed medically unfit to compete. The featherweight champ agreed to step up on just six days notice to face Khabib Nurmagomedov for the lightweight title, after Tony Ferguson was forced out of the contest, due to a knee injury. 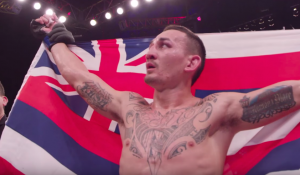 During this morning’s weigh-ins, however, ESPN’s Brett Okamoto reported that Holloway has been declared medically unfit to compete. It’s not known yet if Nurmagomedov will be assigned another opponent, but it is being reported that Anthony Pettis could be a possibility. Pettis was scheduled to fight Michael Chiesa tomorrow, but Chiesa was removed from the card, after he was cut during yesterday’s media day incident involving Conor McGregor and his entourage.